Helping to push the limits of social etiquette, this brew tastes a lot like the orange soda you’re used to, just 4.2% harder. 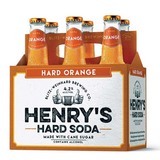 Henry’s Hard Orange is here to help push the limits of social etiquette. It tastes a lot like the orange soda you’re used to, just 4.2% harder.